I’ve got 3 kids, and 3 dogs, 1 of each currently falls in the “less than 2 years old” category, and let me tell you something that 1 year olds love to do. They love to break free, run wild, and basically be anywhere that “adult” eyes or hands won’t catch them or see them. About 2 months ago, we had an invisible fence installed for our dogs and OH MY GOODNESS… if you have pets and don’t have a fence around your yard… you have GOT TO GET ONE. The thing is FRIGGIN AMAZING. Seriously, it is the best money I have spent, in I don’t know how long. I was pretty hesitant to get it, as I was was worried about the “shocks” or the pain or how humane it would be, and also, if it would work at all. My only wish, was that there would be some humane version of it that I could put on my 1 year old little man. He LOVES to sneak out the back door of our house. We have to keep each of our 3 sliding doors barred shut, otherwise he’s got those things flung open, and he is out into the wild in 10 seconds flat. We’ve got a deck that runs all along the back of our house, and its got an opening and set of stairs on one side that opens up into the yard, and a driveway that runs along the side of our house to our neighbor who lives behind us. If my eyes aren’t glued on the little guy 24×7, he could be out that door and onto the side driveway in the blink of an eye. Finally, I decided it was time for a more official gate (and some fun with the power tools!) And I’m sharing that project with you below. Make sure you take measurements before you buy your supplies, as yours will vary depending on your height and width. You’ll want to place your gate ballusters approximately 2.5-3″ apart. In my case, my deck width was 36″, so I had enough room for 9 ballusters. Gate_Width = 1″ less than the opening of your deck, to allow for room on both side for opening/closing. My deck opening measures about 37″ across, so my deck gate measures about 36″ wide. 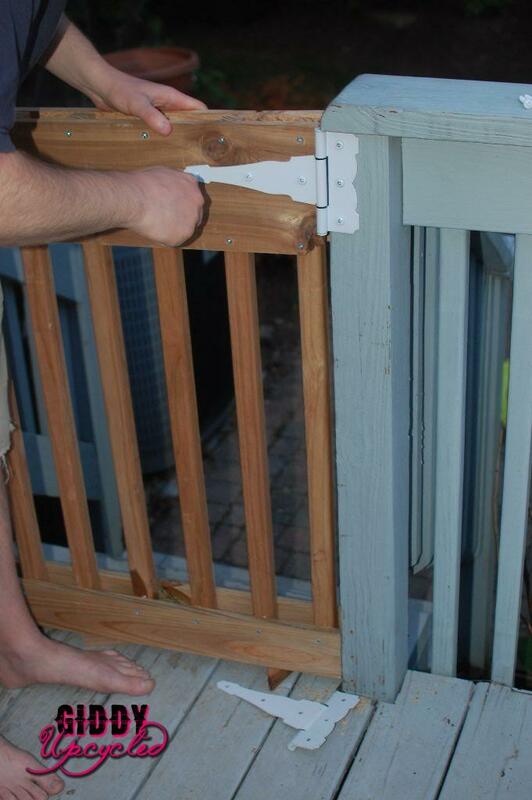 Gate_Height = measure from the deck floor, to the very top of your deck railing. 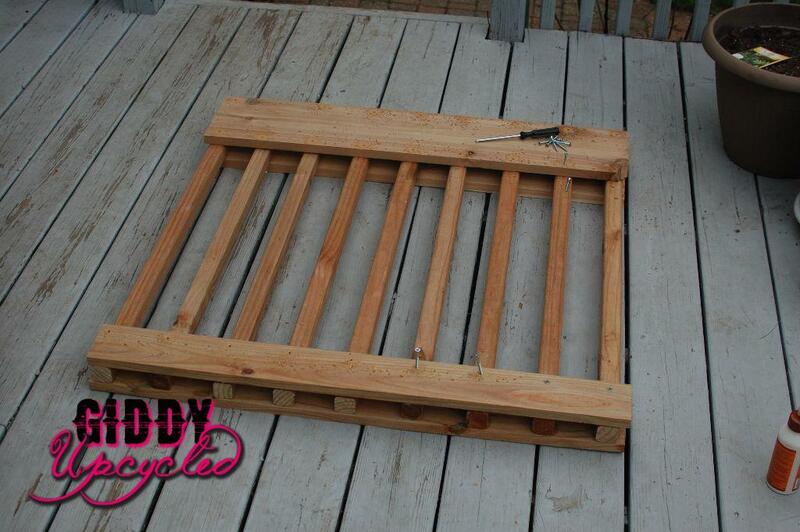 Subtract 2″, and that will be the height of your gate (before the wood top is put on it). 9 – 1″ x 1″ x 36″ pressure treated ballusters ($8.55)- either the flat or angled ones will work, so long as your gate height is less than ~34″ or so. The angled ballasters were only $.95 each vs $1.99 for the flat ones, so I got the angled ones and just cut the angles off. If you go with the cheaper angled ballusters, make sure they are tall enough to go the full height of your gate – with the angled ends cut off. 3. Optional but makes things easier – I put wood glue between all the connection points and let it dry. This prevented the boards from moving around when I drilled holes. 5. After one side is drilled, flip the gate over and drill in the same way, but reversing which side you drill into, for each balluster (top/bottom), so that the screws alternate and don’t hit eachother. 6. Once all your screws are in place, give yourself a big pat on the back, and go have a margarita! 8. 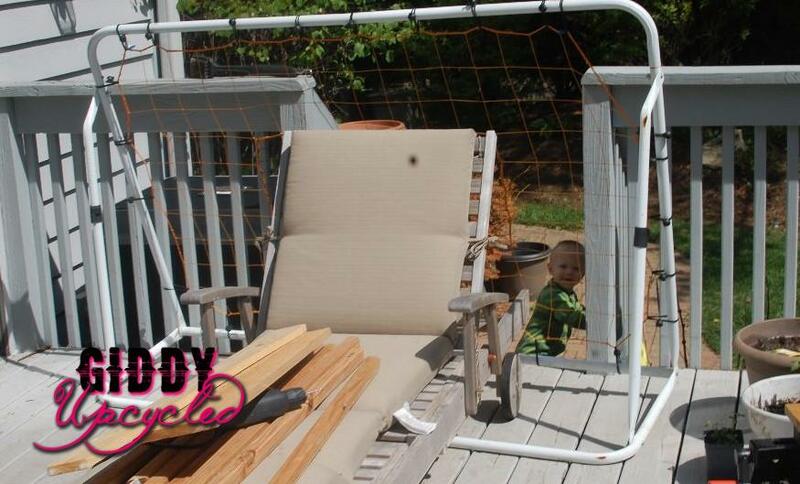 Use a couple of pieces (or a big long piece) of your 1″ scrap wood, placing them on the floor of the deck to give your gate something to rest on. 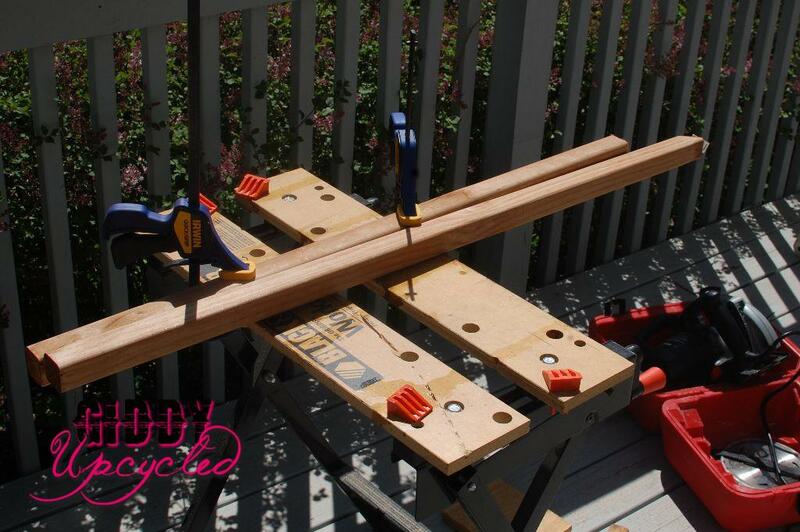 The gate will be mounted 1″ up from the deck floor. 9. Drill and attach your hinges according to the instructions for your gate hinge kit. Be careful to pay attention to the direction you want your gate to swing. In my case, I opted to have it swing in towards the deck. Also, make sure you leave about 1/2″ clearance between the gate and the deck rail, on the side where your hinges will be, so that your gate doesn’t get stuck and can swing freely. 11. 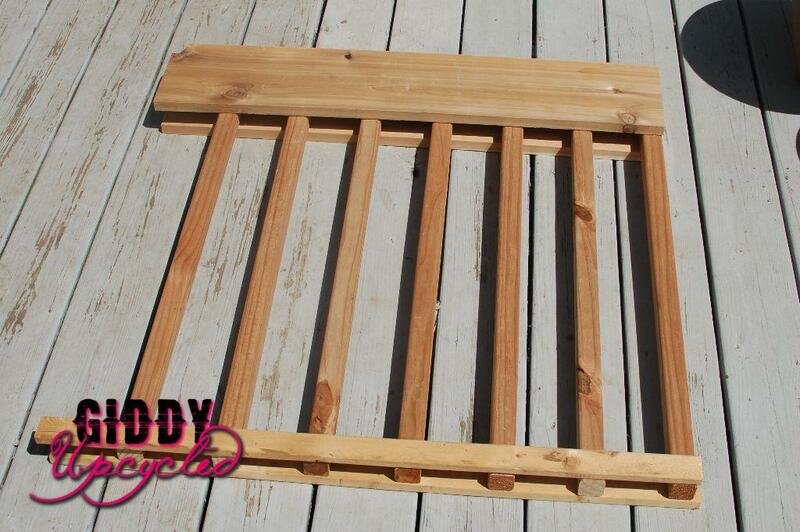 Take your 1x 4 x 36″ board and place it along the top of your gate to cover the tops of the ballusters. Drill along the left and right sizes (making sure the drill is going into one of the balluster ends), and add another 1 or 2 screws closer to the middle – there isn’t a science with this one, just get that thing stuck on there. 12. Give yourself another HUGE high five, you are officially a ROCKSTAR GATE BUILDER!!! Now. If you’re installing this gate to protect a toddler (as I was), bring said child out onto the deck, to gloat and test your handiwork. Hold your breath and restrain your smile as you watch them try to get out and get super frustra….. I just spent an hour building this super awesome, super impressive, gorgeous gate…. I don’t think he’s going anywhere. He can’t get out!!! (Well at least until he figures out the latch). 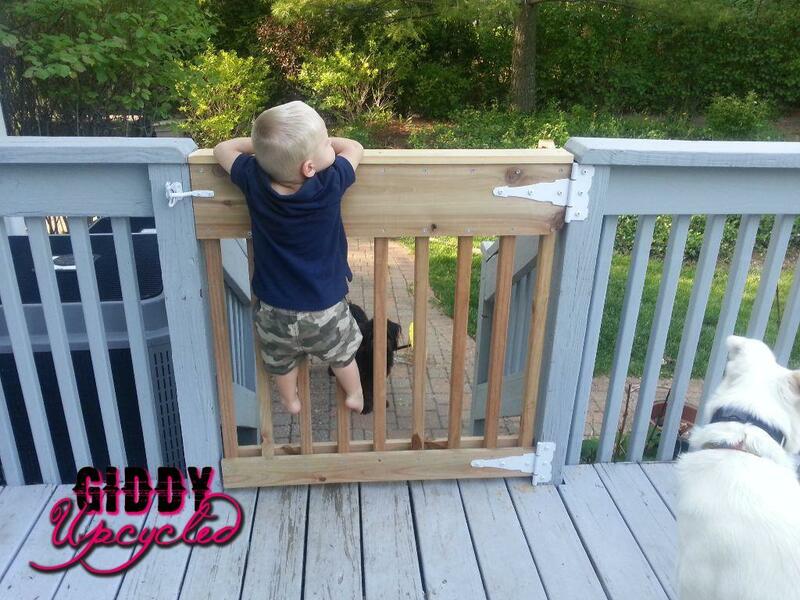 He can spiderman that gate all day long for all I care – long as he’s on this side of the deck, I’ll take that as a successful project, and a $40 WELL SPENT.